Home MMA News Khabib Nurmagomedov Wins Conor McGregor Via Submission In The Fourth Round! Khabib Nurmagomedov Wins Conor McGregor Via Submission In The Fourth Round! Great Rear-Naked Choke Victory Of Khabib Nurmagomedov Over Conor Mcgregor! We are live from T-Mobile Arena in Las Vegas, Nevada. The main event of UFC 229 starts! Khabib Nurmagomedov will fight Conor McGregor for the UFC Lightweight title! The extra security is present! After the months of social media war, these two can finally settle the things up! McGregor looks so relaxed, he lands left hand. Khabib grabbed Conor’s legs, he won’t let his right leg. Both fighters down. McGregor stands up and counters Khabib who puts him to the ground again. 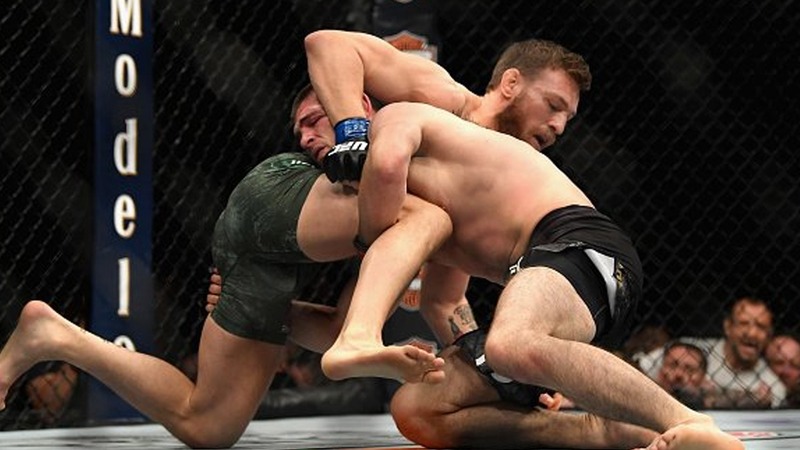 Good elbows from Conor, but Khabib trapped his legs. Conor slips one leg out, he is on the cage. Herb Dean warns fighters to do something. Khabib traps The Notorious’ legs again. Few punches from The Russian. We can hear the first boos. Conor attempts guillotine choke, Khabib goes to full guard, and then to the butterfly guard. Half-guard from Khabib, what a movement. Two punches from Khabib, the round is over. The round for Khabib. Conor tries a kick and a punch, but misses. Left knee miss Conor. Conor Is Knocked Down By Khabib! An overhand right by Khabib, Conor is on the ground, but he stands up. Uppercut miss Conor. Khabib passes to the mount. McGregor escapes to full guard. Right elbow to the head by Khabib followed by the left punch. Good two elbows. And Khabib starts raining strikes of the top!!! Khabib Literally Kills Conor On The Ground! What a ground and pound by Khabib, more than 20 strikes. No defense from the Irishman. Khabib now goes for the Atlas Kimura, Herb Dean didn’t stop the match. Knee to the head from Conor, warning from Herb Dean. Khabib transits to the knee to the belly. Bad guillotine attempt and Conor stands up. Khabib won this round too. Uppercut miss Conor, good straight punch. Khabib misses the right hand, Conor punches to the body. Right low kick from Khabib. Right hand Khabib, who clinches up. Conor on the fence defends well. Right uppercut Mystic Mac. Conor missed the high kick, good body uppercut. Conor kills him. Good knee from Conor to prevent clinching but Khabib survives. And An Amazing Takedown By Khabib Again! Another takedown by Khabib, yet Conor is up against the cage. Left hand Khabib, Herb Dean warns them. Khabib says Conor holds his gloves to the referee. Conor won the round. Left hand Conor. Front kick to the body from Conor, Khabib attacks with a right hand. Conor missed left kick. Russian delivers brutal right hand but McGregor blocks. Khabib trips Conor and gets his back. Khabib passes to the mount. Conor slips out but The Eagle returns to the half-guard and rains punches. Khabib has his back again, goes for the rear-naked choke. The hand is not under the chin yet. The end of the match, but Khabib goes over the fence and starts fighting Dillon Danis. It turns out into a huge brawl! Conor McGregor is also attacked! This is the real street fight! What a bad way to end UFC 229! Final result: Khabib Nurmagomedov wins Conor McGregor via rear-naked choke! Previous articleTony Ferguson Defeats Anthony Pettis In A World-Class Fight Via TKO!